Some summer days, we have way too much fun! And suddenly I realize that it is almost dinner time and I am not prepared… again. Yesterday was one of those days. And to make things worse, I was also supposed to make dinner for one other family! Yes, I know, get it together Maria. here is what I did, I ran out to the grocery store, and bought two rotisserie chickens, came home and prepared to use anything in my way to make a wonderful dinner. Don’t tell me that you haven’t done the same! I grabbed a bag of slaw veggies, some fresh cilantro, a few tomatoes, and some beautiful limes. the first thing that came to my mind was Tacos! does it not make total sense? 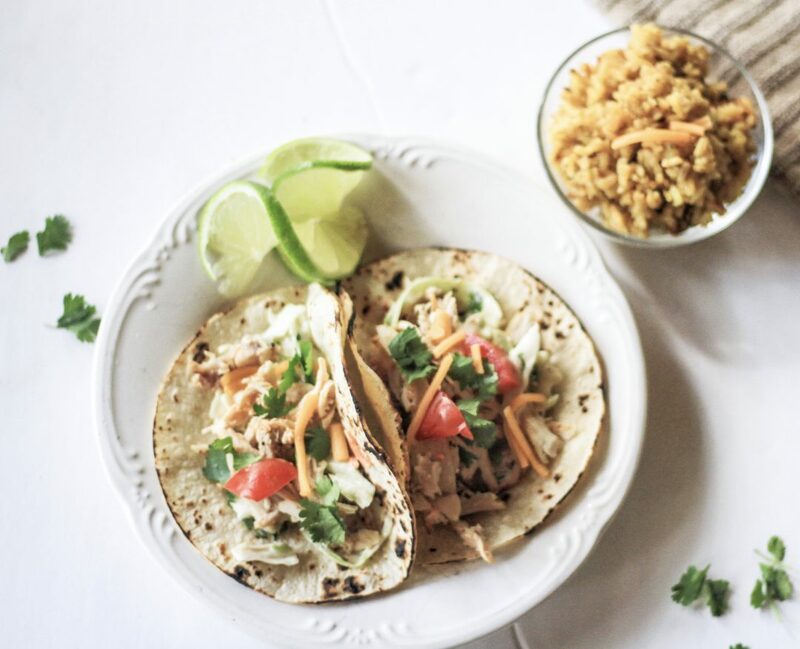 Don’t shut me out just yet, I thought slaw is summer and tacos… well tacos are the best! 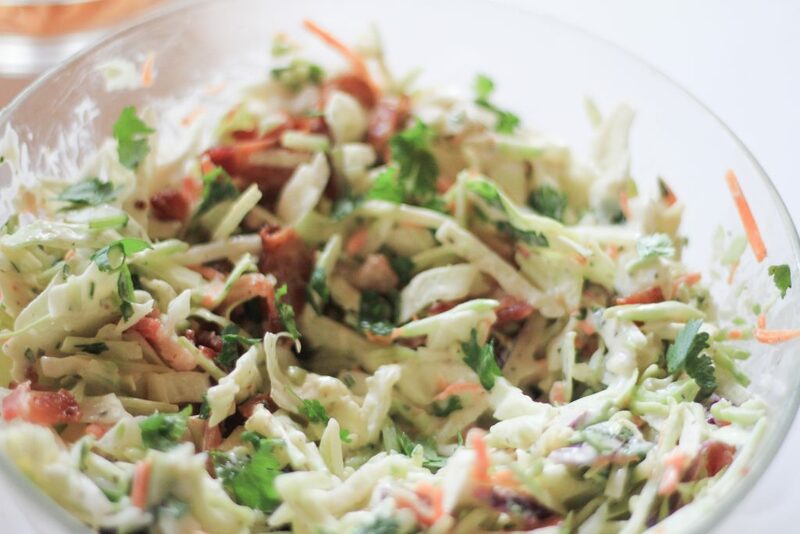 So I grabbed some creamy cilantro lime dressing, cooked some bacon slices and mixed both of them with the slaw veggies and some loosely chopped cilantro, to make an amazing limey slaw that I planned on using under the chicken in my tacos. Since I wanted to take the flavor to the next level, I added some smoked chipotle and fresh lime juice which made it just perfect to my taste. 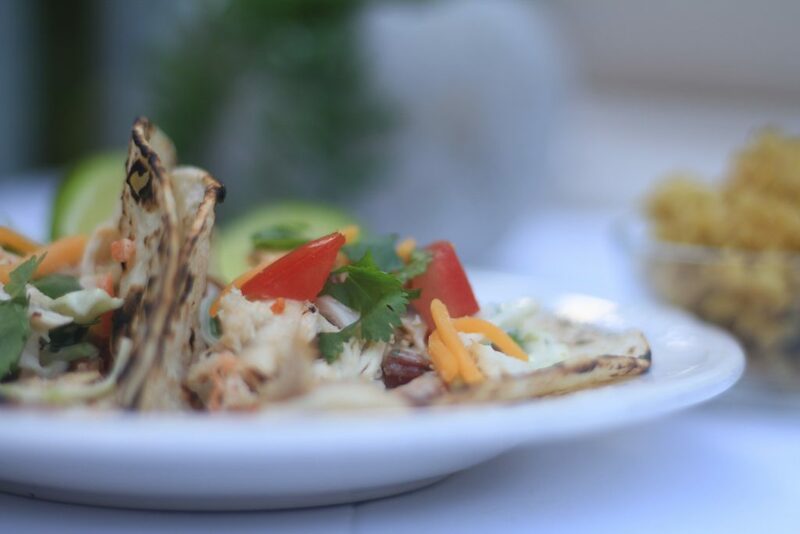 Now that my base was ready, all I had to do was shred the chicken and add some chipotle seasoning and lime juice to it, warm up some tortillas and prepare a few garnishes like chopped tomatoes, cheese, fresh cilantro, some extra cilantro lime dressing and lime slices. To complete the meal, I made some awesome quinoa and brown rice with some special seasonings that I will have to share on another post. And there you have it, now dinner was ready, and I had time to snap a few quick photos for you all! You can use this time to get all pretty for dinner, make yourself a margarita, or simply take a deep breath and get yourself in the mindset for a wonderful relaxing evening. Summer dinners are always so fun. You have stories to tell and very hungry tummies to feed. I hope you try these and tell me how you liked them! 1 Bag of already cut slaw veggies. 1 Cup creamy cilantro lime salad dressing. 3 tsp. Smoked chipotle seasoning. Put the shredded chicken on a serving bowl, sprinkle smoked chipotle seasoning and the juice of half a lime on it. Cover and set aside. 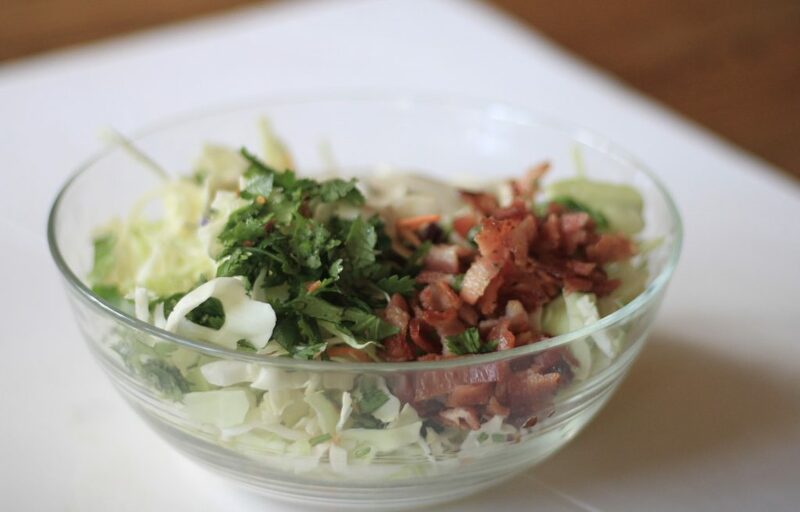 In a medium bowl, put the slaw veggies, cooked and chopped bacon slices, creamy cilantro lime dressing, chopped fresh cilantro, and 2 tsp. pf the smoked chipotle seasoning. Mix well, add juice from 1 1/2 limes and mix one more time. cover and set aside. If dinner is hours away or you are taking this to a potluck, you will want to refrigerate this until its time to serve. Cut the tomato in small cubes and set aside for serving time. 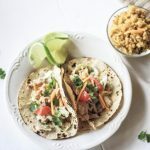 Serve with some warm tortillas, I put the chopped tomatoes, some shredded cheese, extra chopped cilantro and lime wedges on the table for people to assemble their tacos as they want. 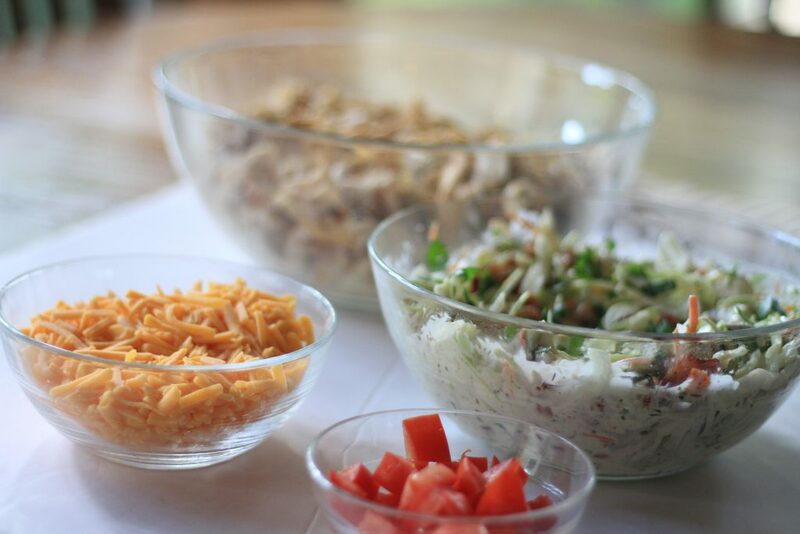 To Assemble each taco, put a spoonful of the lime slaw on the tortilla, then the chicken and then the garnish. I didn’t feel like salt was needed but you could have some at the table just in case. I also made some rice to serve on the side. Oh my those look so good! Printing the recipe now! so excited to hear how it goes! My mouth is watering and it’s 7 am. I need tacos! we always need tacos! right? Oh I can’t tell you how many times I get to dinner time and think the same thing…what now?? 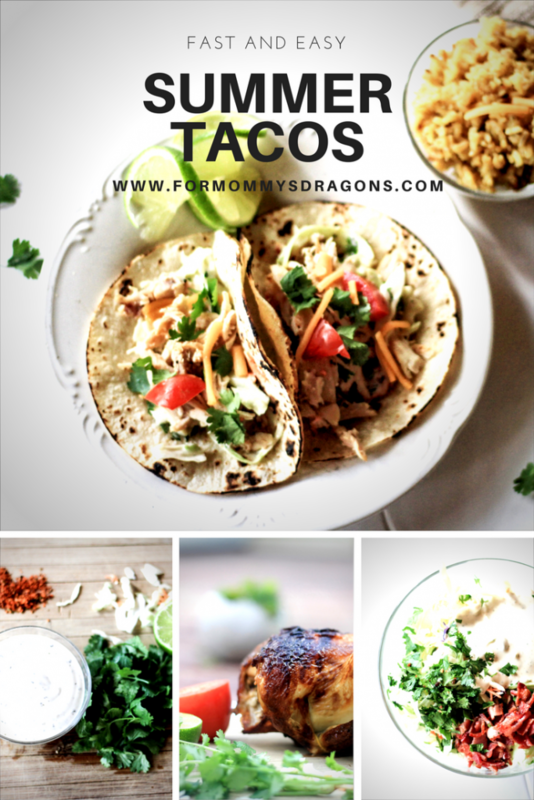 This recipe is great…tacos are always a hit in our family! Wow! Your photo quality is amazing. I love this post and I love how your blog is set up! Summer tacos are brilliant (I’m not just saying that because I make them myself at least once a week!) 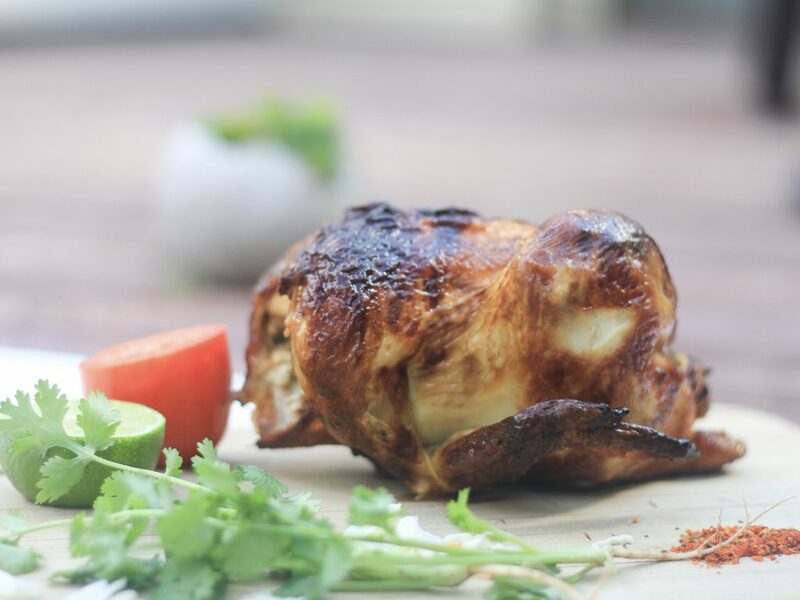 I never thought of using rotisserie chicken though – that is seriously a great idea as they are already seasoned and you don’t heat up the kitchen with baking them. yes! it really is so easy! also tacos once a week?? you sound like my kind of gal! Love a good taco! Going to have to try this one out.